Home >> HAWK Signals: How Do They Work? 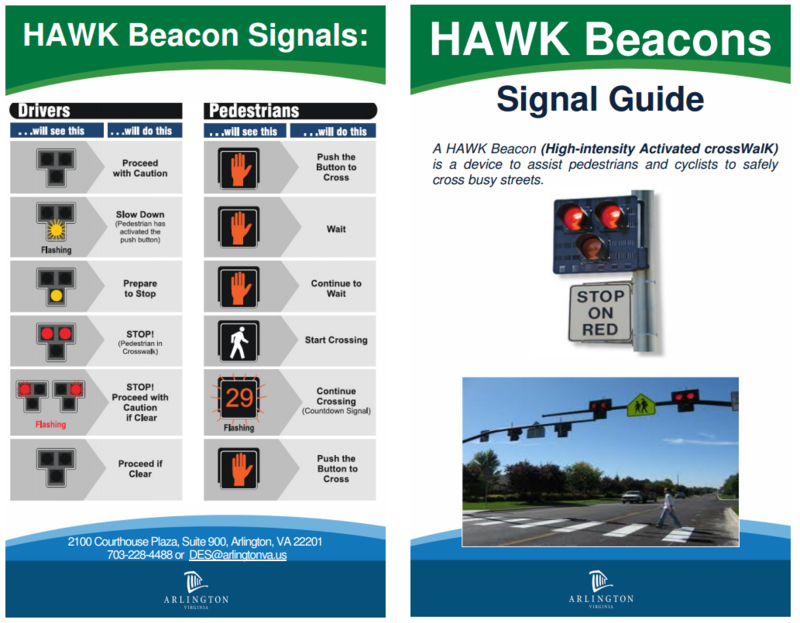 HAWK Signals are pedestrian-activated traffic control devices that help make pedestrian crossings safer for everyone, whether you are walking, rolling, or driving. Whether denoted by painted parallel lines, zebra stripes, or simply two streets crossing, crosswalks are an important part of life in Arlington. They help clarify safe spaces for people walking. In the past few years, the way engineers and planners think about street design has changed. Some of the big changes include adding protected bike lanes and enhanced crosswalk treatments, like HAWK signals. Arlington County has continued to be a Complete Streets leader, installing these treatments in order to provide safe streets for people of all ages and abilities. What is a HAWK Signal? A HAWK (High-Intensity Activated CrossWalK) signal is a device used to assist people with safely crossing busy streets. HAWKs work the same as other button-activated traffic signals, either by pushing a button or an automatic sensor, which directs the person walking or biking to wait for the signal to change and traffic to stop allowing them to cross safely. For a driver, the HAWK signal appears differently than other traffic lights. At rest, HAWKs remain dark. Once triggered, it will then go through a series of yellow and red sequences requiring motorists to slow down and stop. After the people walking and biking cross, the HAWK will go dark again, allowing motorists to continue through the intersection. Where does Arlington have HAWK Signals? HAWK signals provide safer crossing alternatives for people walking and biking than traditional crosswalks, especially in mid-block locations with heavy demand. Because the devices are only activated when walkers or bikers are present, people driving experience minimal delays. HAWK signals can also be installed at the intersection of an arterial road with a smaller side street, which would not otherwise warrant a traffic light signalized crossing. All of this amounts to easier crossings on busy streets for people walking and biking. Data also suggests that HAWK signals create safer crossings, reduce crashes and increase driver compliance with crosswalk laws. While I appreciate the effort the new signal is somewhat confusing. All would be better served with a clearly understood traditional signal. Perhaps using technology it could detect the absence of pedestrians and switch back to green or flashing yellow for drivers. These things are a little annoying as they really slow down traffic – mainly because motorists do not know that you can drive if they are flashing red, so often on Georgemason traffic just completely stops while they are flashing. And I don’t blame motorists – who would know what these things mean?